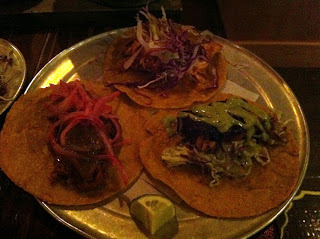 Graham Elliot has been our list for a long time since it's a name often spoken in Chicago foodie and culinary circles. I'm also a devoted lollapalooza participant and admire the work Chef E has done with Chowtown. Another catalyst to try the flagship (I've been to grahamwhich and want to try the Bistro) is that an unusually large number of people in recent months have given high marks to ge. I'm very suspect of the entire Michelin Guide rating system but especially so when they give our their "stars." 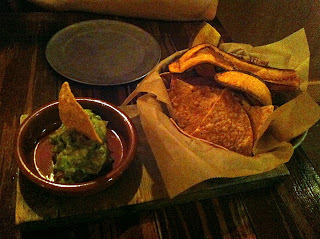 I can say I completely agree that GE deserves a star and is one of the best dining experiences we've had in the past year. There is a lot to love about the experience but most important is that the food lives up the high marks and delivers interesting yet not complicated courses. In addition to the food I really enjoyed the atmosphere and especially the soundtrack - it was as if they were playing my iPod or Pandora station all night. I'm not one to usually notice the music (unless it's painful), but Erica definitely got sick of me saying "that's another great song!" (It also makes sense given the combined affection for all things Lolla). The service was very good without being in the way or noticeable - they were all very well trained. Why did I love the food so much? There wasn't any one course in particular that caught my attention and screamed "this is amazing!" But when I'm enjoying a 10 course meal, consistency (no bombs) and an element of surprise are key to having a good time and keeping your attention. I really enjoyed the pea (soup) course (reminded me of my mother's pea soup) and the risotto - super rich with parmesan, basil and truffle. The main courses of halibut and beef were spot on and fun. My beef was slightly under-cooked to my enjoyment but the flavors were very nice and simple - letting the food speak for itself instead of trying too hard. We are still looking for a great Thai place in our neighborhood, especially one we can use for take out. This weekend we had a craving and I wanted to give The Village another try since everyone else speaks so highly of it and it's close. We kept it simple with an order of egg rolls, pad thai and the noodle combo. The egg roll was much better than I expected and definitely worth trying. The few bites of Erica's pad thai seemed good and much better than our first experience. The noodle combo was nice and usually spicy but they might have forgotten the spice part. 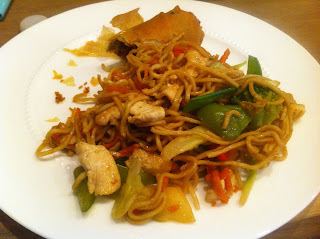 It definitely needed more sauce and/or flavors but the noodles were nice and had a good mix of vegetables and chicken. I would try that dish again if I can get the extra sauce/spice or just sriracha sauce. Our first try was sub par and our second was better but still not world class. Perhaps we need to go in person for the real deal but not sure when that will happen. Go now before it's too late!! Only on day left (today) from noon to 10pm in Northcenter starting at the corner of Damen and lincoln ave (and Irving Park). Ribfest is one of my favorite (of the many) Chicago summertime neighborhood festivals. I love bbq, I love ribs and being outside in the summer is gravy. There is also live music on two stages throughout the day. Suggested donation to enter the festival is $5 per person, but don't be intimated if you want to give to less - they can't make you give anything. Like most food festivals everything is purchased with tickets and not cash at an exchange rate of $1 per ticket. Most vendors have samplers of ribs for 6 tickets (includes 3 bones), and half slabs for 11 tickets or full slabs for 20. Other times vary by establishment like brisket, pulled pork, beans, mac n cheese, etc. #1 - Robinson's No. 1 Ribs - all around best cooked ribs, lots of meat, great bbq sauce. Hard to believe one of the larger more well known places was my favorite but they know what they're doing. 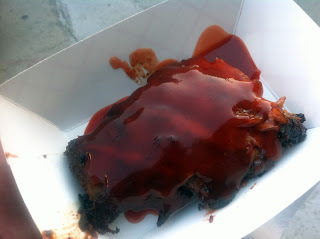 #2 - PitchFork - really love the tangy bbq sauce and meat was super tender but wanted more per bone. Always a fan favorite of ribfest. 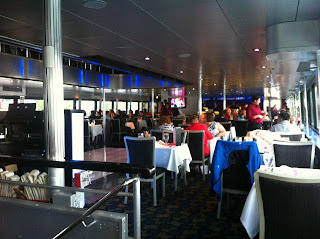 This past week Erica and I were invited to a dinner cruise and fireworks show aboard the Spirit of Chicago. Spirit is one of those large cruise boats docked at Navy Pier that I have never been on. 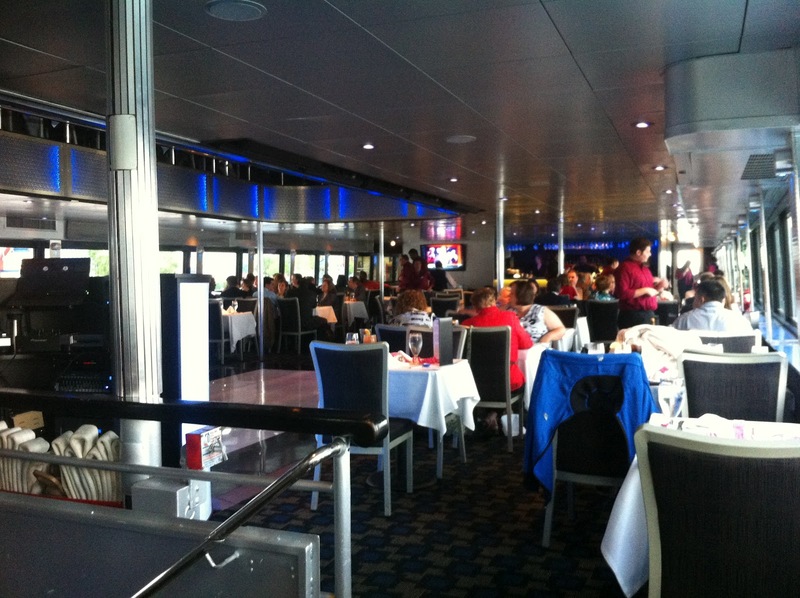 It's a huge ship with three levels of dining and two "dance floors". The program is buffet style food with music, dancing and singing servers "cabaret" style. The whole thing is a bit cheesy and most everyone is there celebrating a special occasion (and on our cruise celebrating either Prom or high school graduation). The food was surprisingly fine and we couldn't keep our eyes off the dance floor filled with teenagers (an interesting source of entertainment). The fireworks show off of Navy Pier is always fun and except this night happened to be when the surprise cold front from Canada came down in late May for 50 degree winds. On a nice hot summer evening I would be perfectly content to eat dinner and relax outside on the water watching stars or fireworks. 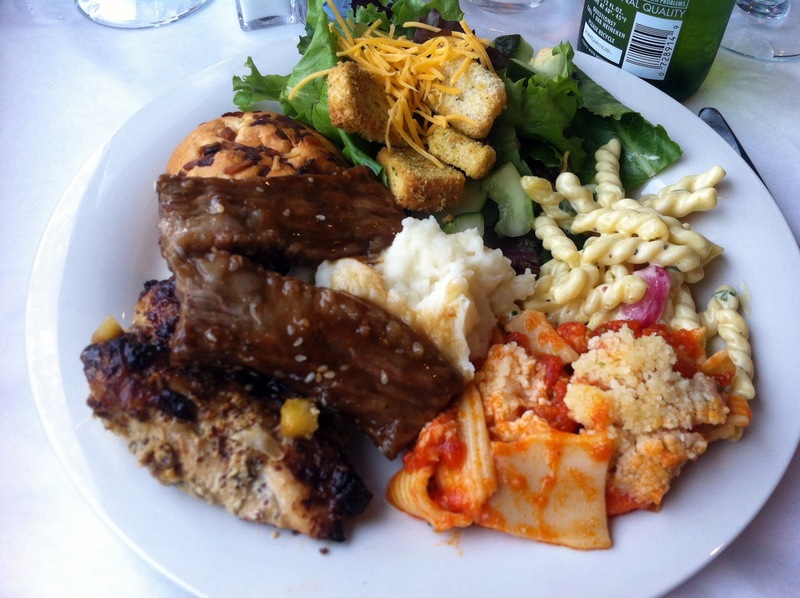 The buffet featured salad, pasta salad, chicken, fish, pasta marinara, mashed potatoes and thai short ribs (probably other stuff I'm missing). Best food was pasta, mashed potatoes and chicken. We also enjoyed the dessert line with melted chocolate fondue style with fruit, marshmallow and other treats. The whole thing is a little goofy and different but definitely a unique way to have an evening out and celebrate. Not sure I would rush back on my dime but I'm always looking for fun ways to gather a crowd.